Mary Ullrich walks on Wednesday along a row of balloons she helped place near Paradise Ridge south of Moscow. 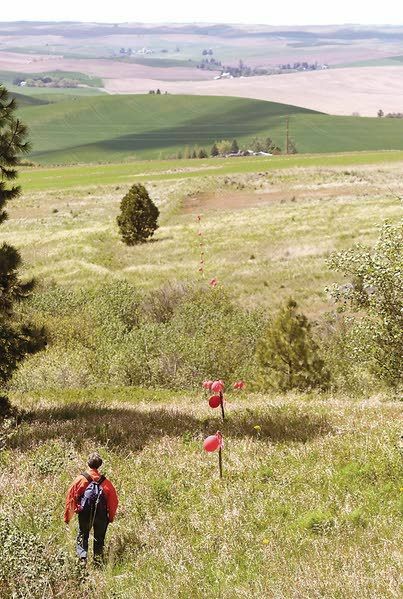 The balloons mark the width of a 600-foot-wide corridor that would be cleared for a new section of U.S. Highway 95, if it follows the eastern route referred to as E-2 (Geoff Crimmins /Moscow-Pullman Daily News photo). “If I were a deer, I’d be pissed,” Ullrich said of the proposed E-2 route, which he said would cut animals off from their water. The highway itself would have four lanes – wider than the current span – to improve driving safety. Up to one-third of the space would be for road and shoulder, but wide swaths of land on each side are planned for by ITD to protect wildlife. Idaho Department of Fish and Game recommended years ago that ITD not choose E-2. A letter written in 2007 by Dave Cadwallader, the IDFG’s Clearwater regional supervisor, stated it would “have the greatest direct and indirect impacts to wildlife and other resources” of the proposed routes. The Paradise Ridge Defense Coalition and some government agencies, including IDFG, the Environmental Protection Agency and U.S. Fish and Wildlife Service, have said during earlier planning phases they prefer C-3, which would be nearest to the original route on the northern stretch. Some, including at one point Fish and Game, have suggested ITD create underpasses for animals to safely travel around the area without having to cross the new stretch of highway, but cost will be a factor. “The cost of creating a wildlife underpass versus a more open area of highway are difficult to determine without additional design work,” said Adam Rush, an ITD spokesman. The Paradise Ridge Defense Coalition has also brought up concerns about E-2 regarding losses of wetlands, farm land and conservation reserve; and removal of acres of pine stands and related habitat. It also would cause more noise, have a wider visual impact and not be the safest for travel because it is at a higher elevation than other routes, the coalition contends. Patricia Clyde said her late husband, Robert, own land along E-2 and C-3. E-2 is preferred because it wouldn’t cut through their family’s prime farm land as C-3 would. C-3, she said, would eliminate a great deal of this working land and leave the remaining farm land cut in two. 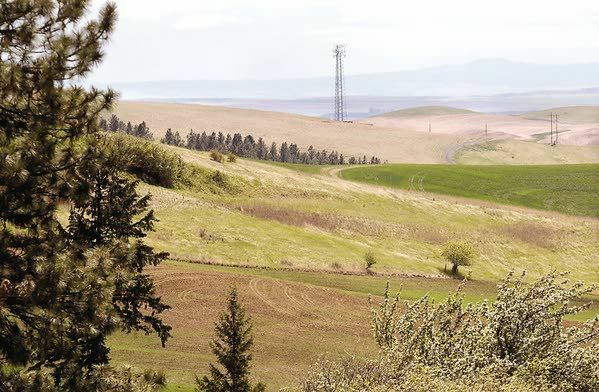 Clyde pointed out it was her husband’s intention to work with ITD “while ensuring the integrity of the remaining farmland which stretches along the proposed route from Reisennauer Hill to Zietler Road and beyond closer to Moscow,” she said. And with C-3, a good number of existing properties near the current highway would need to be taken out, she said. LeNelle McInturff, who lives between Moscow and Genesee, said she’s driven the stretch of the old highway for decades, and more than anything, she added, she wants to see a safer route – and E-2 appears to her to be the best option. The project could reach its decision phase by or during the fall. Notice in the Federal Register of release of the Final Environmental Impact Statement and the 30-day review period could begin soon. ITD’s goal is to start construction in 2017 and have the work completed in a couple of years. 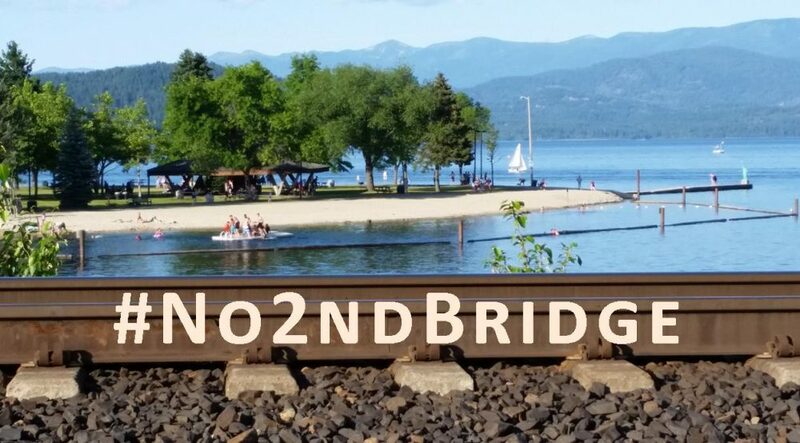 Though the E-2 route has been estimated to cost up to $48 million, it’s actually not yet known how much the project will cost. Price will be more apparent once a final alternative is chosen and additional design work is completed, Rush said.